Anna Feher became interested in the beadwork jewellery of rural areas of her native Hungary during the 1990s; she started the Hungarian Bead Society in Budapest, she researched the designs, techniques and meanings of the various colourful styles to be seen in beautiful necklaces, collars and fine bead embroideries that formed part of the costumes in some regional communities. 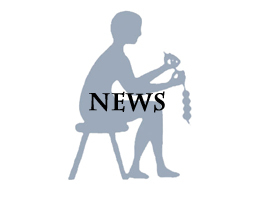 Together with her students and other enthusiasts she has rediscovered patterns and methods for creating new individually handmade pieces that are inspired by traditional work but harmonise with modern fashions. I am really happy to be able to offer some special examples of her work for sale on my "Beadtreasures" website- Do take a few moments to have a look! Lazsias coin pendant necklace: handmade silver plated copper coin pendant. Length 23" (55cm) available with pearl colour or black beads. "Ocean" blue necklace - Czech glass and original hand-embroidered beaded felt balls. Length 19" (45cm). "Olive" bead necklace. Glazed gold lustre hollow bead made by Eva Thomas, Lithuanian ceramic artist, with Czech glass and amber discs. Length 18.5" (48cm). "Spirals" necklace. Glazed gold lustre hollow bone china bead from Lithuania bead with Czech beads length 19.5" (48cm). "Martian" necklace. Glazed gold lustre hollow porcelain bead from Lithuania beaded by Anna, with Czech beads. Length 17" (43cm). Blue floral earrings. Handmade hooks, bead embroidered felt beads 1" (2.5cm). Sunny colours beads earrings. Ghana powder glass beads, bead embroidered felt beads and Czech flower beads 2" (5cm). "Water Chestnut" earrings. Felt beads embroidered with tiny beads and floral shapes. 2" (5cm). "Cloves and heart" necklace. The bead embroidered felt heart and beads with bird and flower pattern is a Transylvanian style from Kalotaszeg, Anna has added the cloves to this design. Length 20" (50cm). Here is my first website, where I offer interesting rare and collectable beads for sale, both new and antique, as well as original necklace designs and traditional pieces including ethnic metal jewellery, and vintage beadwork items. Everything shown here was typical current stock in my lovely bead shop in Portobello Rd which closed in 2001 remembered fondly. Since then stuff was stored while I looked after my very elderly mother, babysat grandchildren, wrote about beads, taught classes, lectured, while undertakeing consultancy work identifying antique beads for a specialised auctioneer. Now this website gives me the opportunity to display and sell many of my special beads in the very latest 21st Century way! The most popular collectable beads are the Antique colourful Millefiori decorated glass beads that were made by hand on Murano, an island off Venice, at least a hundred years ago and traded into Africa in enormous quantities. Their appeal lies in their unique patterns. Also destined for Africa from Murano, at that time were handmade glass "lampwork" beads with delicate coloured trailed glass designs, and until recently they could still be found in Africa. Now however its hard to find such variety, or any beads of metal, stone, coral, precious woods, bone, shell, ceramic and amber in particular. I hope you will have time to explore my pages, using the Search facility. The merchandise is grouped into 5 main categories: Antique, Ethnic, Millefiori, Original Necklaces, Special beads and Portobello beads. More items will be added on each of the pages in due course. In this section which extends up to about 1920s, there are both European jewellery beads and trade beads -some are single lampwork beads, some as small collections and some wearable strands as loops often with their original stringing, and rethreading with a proper clasp may be recommended. If you are designing you will want to rethread them anyway. You will find many Venetian trade beads if they are not specifically Millefiori, such as layered or striped drawn beads, and the beautiful and sought-after Chevron, Star or Rosetta beads. Included are antique beads from Bohemia often found with them that were also originally traded in Africa, as well as beads of all styles and other materials known to be antique from other parts of the globe. There are a huge variety of typical and rare patterns many sold on their own. In this section I also have some very collectable authentic traditional antique English lace bobbins each of which has a "spangle" - a wire loop at the end holding a few handmade glass beads that are quite distinctive and maybe made locally at the time - they could be at least 200 yrs old. In this section are all kinds of beads and bead jewellery that are associated with traditional and tribal costume, ranging from the sophisticated beadwork cache-sexe aprons of Cameroon, etc to chunky locally mined bauxite cylinders from Ghana, from complicated and large lost wax cast brass from Nigeria to bunched, multistrand collars from northern India - as well as traditional silver craftsmanship from Afghanistan, Morocco, Ethiopia, or South America. There are quite short cylindrical slices and also long "elbow" beads. Some have been previously ground at either end at a slant so when threaded tightly they make more of a curve. A few beads with desireable patterns have damage at one or both ends, but clearly can be ground down to a slightly shorter length, which is why the prices vary a lot. Venetian millefiori pattern units were also used to make more delicate round beads for conventional jewellery particularly from around 1920s, not just for trade in Africa, so some of those beads may be in this category. This section will include not only necklaces that I have designed and made using combinations of interesting beads but also restored necklaces of existing matching sets of special beads that had come apart, for example a long necklace of graduated-sized Venetian jewellery beads from 1920s which I have rethreaded on a braided cord in matching colours. 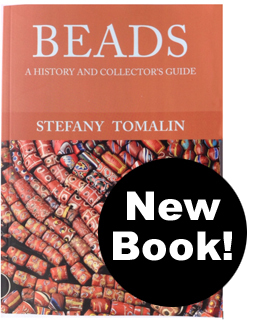 Here you will find various single beads or small sets that are particularly valuable or unusual, that may be of interest to a collector. Soon there will be a good selection in this category. I intend to include some recently made artists' beads. There are quantity beads by the kilo from the stock of my shop, many types no longer made, both for jewellery and embroidery crafts. The embroidery beads, rocailles or seed beads that I have are from old couture costume and dressmakers workshops. Long before the Japanese made the mechanically regular Delica beads, many embroidery beads were made in Italy, Czechoslovakia the far east, and France. They were also the ones preferred in Native American beadwork, and were available in lovely subtle colours. Quantities of some sizes and colours are limited.